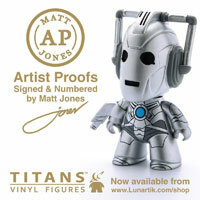 Currently on offer at www.bbcshop.com for £99.99 with free UK Delivery. 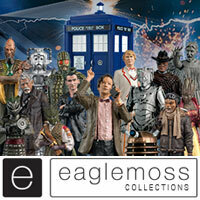 Announcing Karen Gillan Signature Edition Exclusive 1:6 Scale Collector Figure. Amy Pond first met her ‘raggedy Doctor’ when she was a little girl and waited fourteen years before he finally returned to whisk her away in the TARDIS. Brave, bold, decisive and always ready to confront the problem, Amy has battled the Silence, escaped the Weeping Angels, encountered the Daleks and yet still found the time to marry her childhood sweetheart Rory Williams. BIG Chief Studios Ltd. is proud to announce the Amy Pond 1:6 Scale Collector Figure, officially licensed and authorised by BBC Worldwide. 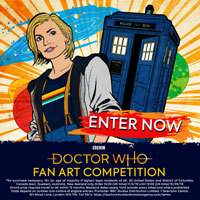 Featuring a fully realised character portrait of “the girl who waited” as portrayed by actress Karen Gillan, authentically styled hand-tailored detailed costume, signature accessories and a partial TARDIS display base. Well I’d recommend this to people, although I’d strongly recommend also buying the alternate head from Big Chief Studios. The head it comes with looks barely anything like Karen Gillan, whilst the alternate head with sculpted hair carries a strong likeness. Personally I paid extra to get the Signature Edition, which I think is definitely worth it and is something that I’d never part with. Now I’m looking forward to getting Big Chief’s Series 7 Eleventh Doctor, Twelfth Doctor, TARDIS and their 2nd Tenth Doctor (since I missed out on their 1st one). how do you get the sculpted hair one? Well Amy Pond is now out & many have received theirs,how do you rate her? Must only be a matter of time for this now,a year since it went on pre-order! hopefully this will be out by the autumn or by christmas,i thought it would be popular as amy is popular character,we will see,hopefully soon\? 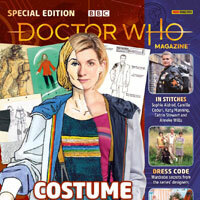 I am planning on getting the doctor figure of this and am not sure at all if i should get this or not, if i had lots of money i would, but i have only managed to let my parents let me get the other (if i keep asking i could get this if i want) but by the time this is released, amy will have left, so i dont know if i shld get it or not? 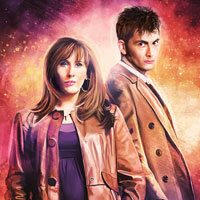 Also i know you dont kow but do you think they will make a figure of the new companion? I really need help, i love the figure but not sure, if i should get it, HELP!!! What do you think booboo? I mean, the Amy pond is fantastic, but I’m not sure as its a lot of money, but well worth it, and she will have left by the time I get it, so I wonder is it worth it or should I wait and see if the make Jenna louise colemans character?? They haven’t sold many Amy figures, I have emailed them, so I may get the doctor then if I really like it maybe get Amy! End of april sounds reasonable,i shall purchase one! 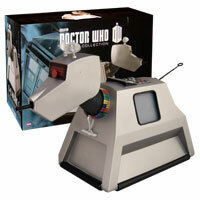 Forbidden planet are seeling the ordinary edition and that says shipping date 10th june! Any news on a shipping or full buying date boobo? big chief and forbidden planet are selling this,the detail and quslity looks impressive and it is highly collectable,nice range of accesories too. oh, sorry! just skimmed the writing! Just got the signature edition one! I got no.3!!! Can’t wait to get it! Anyone else buying one? what number have you got booboo? Maybe it will go down in price. Remember when the PS3 was first coming out ? It won’t go down in price, there will be alternate ways to buy it eventually with seperate bodies and costume packs to allow you to get it but in slightly more affordable chunks. Bringing down the overall price would be impossible though, the figures just cost too much to make. What do you mean by “seperate bodies”? I have heared of the costume packs but not those! Do you mean a bit like a collect and build figure? Well, if you imagine the sort of generic Action Man/Barbie doll bodies then it is along those lines but without the head attached. These will be released to allow you to use the costume packs and the accessory packs can be used without buying the original release. They should make a cyberman! And a silurian! 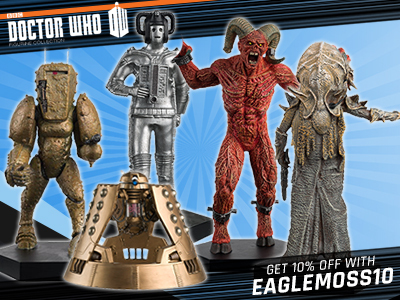 And Riversong and a Dalek (any Dalek variant will do, as long as its not a big headed emperor, Davros, or those New Dalek Paradigm Scientists) actually i don’t really mind if they release any of those as a Dalek, and Davros. 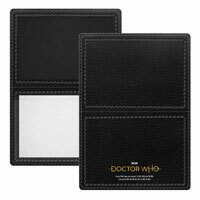 A River Song is planned, we have already seen one of the accessories on their Facebook account. 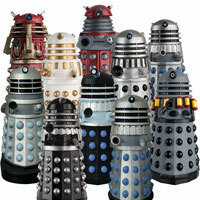 A Dalek is also planned (probablly starting with the “Dalek” version with mutant reveal and removeable spheres) but it will not be coming out this year. Reading on Facebook, someone asked what figure will be next in this range, they said the Tenth Doctor then the Weeping Angel. Then for the figure after the Angel information will be “fourth” coming soon. 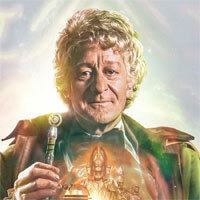 I want the Doctor, and hte Doctor’s accessory pack. OMG, just checked the website it’s over 100 pounds, I haven’t a chance of getting this in the near future, unless it goes down in price. probably too expensive,i will get a masterpece collection one,only 49.99 from forbiden available late march! Well, 2000 of the regular figures are made for £150 a go (£125 before VAT) so £250,000 would guarentee it being made. Quite a bit then.